Last year I heard about the Desire to Inspire Challenge on the Henry Glass Co blog. It sounded interesting... you send them some pictures of some of your work and you might get a chance to design a quilt with their fabric. If chosen, they send you fabrics, give you a deadline for completion and you have to design something out of those fabrics. Sounded like fun to me...who doesn't like surprise packages of luscious fabrics coming in the mail? So I sent in my info and recently they contacted me to see if I was still interested in being a part of the challenge. Of course I said yes and anxiously waited to see what they would send me. It was exciting when the box arrived, I couldn't wait to open it. Inside were these gorgeous florals from the Flower Girl collection by Margot Languedoc. I loved the colors and the prints she incorporated in her collection. I started to think about designs that would showcase these fabrics as well as the Folio blenders that came with them. I spent a lot of time working on a design, experimenting with several block combinations. The floral fabric seemed to be a modern version of the classic floral while the yellow had a really modern feel. I knew I could fit a few of the Folio blenders in somewhere. So I played with the design off and on for several weeks in EQ, trying to come up with something modern yet classic. One of the challenges in making this was designing something that used the amounts of fabric that I was given. I spent many hours figuring which fabrics could work where, as I was given more of some fabrics than others. I finally decided on the Flying Kite block and designed the Axel block to connect them. I won't bore you with all the hours of cutting and sewing, so we'll fast forward to it on the design wall! Crooked, but there! 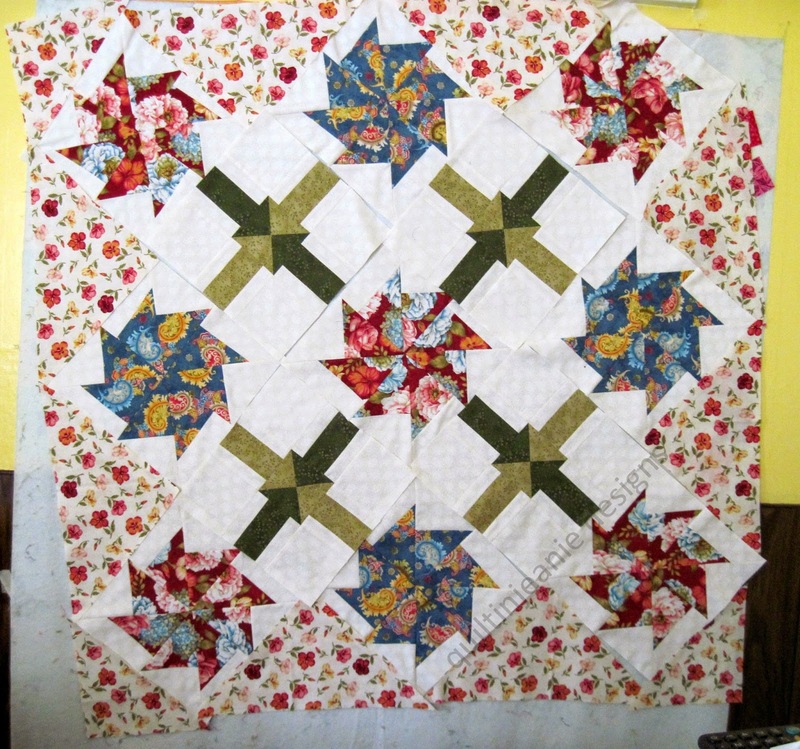 I had chosen the small floral for the setting triangles and so I was very happy when I got them on the wall with the blocks to see how they looked. I could have used the yellow too, but the floral seemed to bring out the colors of the other fabrics better and had a fresher look. As I worked on finishing the quilt top, I tried to figure out what to do for the back. I kept wondering how the blue paisley would look with the yellow print, so I decided to make a 27" block using it for the back. Here it is on my design wall with a 12" block for comparison. Oh yea, loving this! I used more of the yellow print and then a white solid to surround this block and make it large enough to back the quilt. Now to quilt it! I loaded it and used my favorite panto, Leafage by Keryn Emmerson. As I was trimming the batting after quilting, I realized that I had a helper! 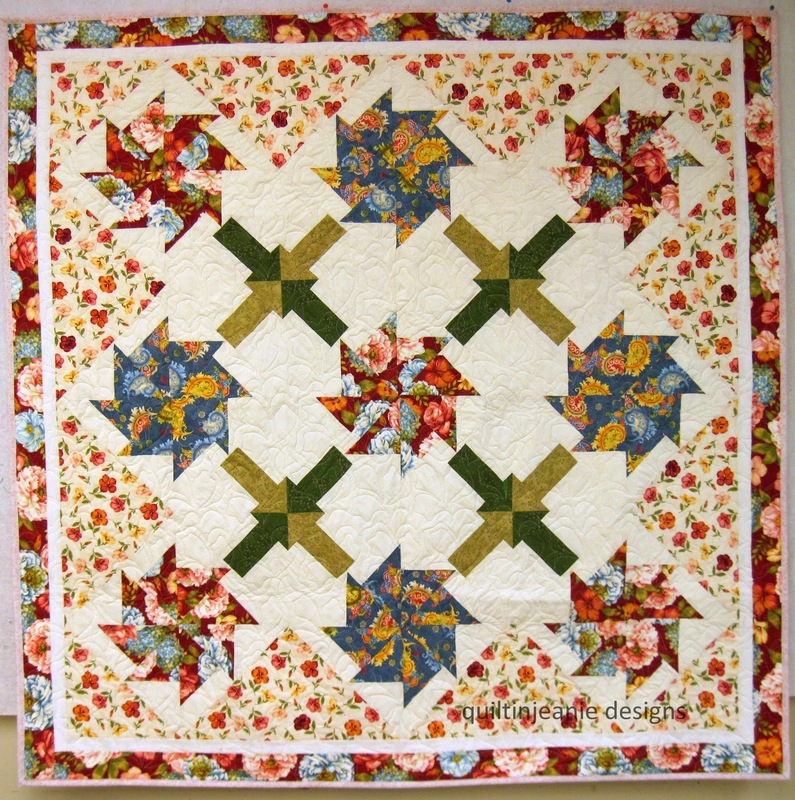 At 58" x 58", Turning Cartwheels will make a great table cover, throw or wallhanging. It was fun to take part in this challenge. I feel like I have learned a lot as I worked my way through the process and I would encourage anyone who likes a challenge to go to the Henry Glass blog and inquire about the Desire to Inspire Challenge. Plus you can see Turning Cartwheels and the blog post about it. Go visit and tell me what you think! I might be getting a little carried away with celebrating, but I don't care! You can't celebrate too much, right? I'm going to do a special giveaway if you comment on this post about my challenge quilt. I have some untouched fat quarters that are just begging to be sewn into a project. Leave a comment on this post to win these gorgeous fabrics. No rafflecopter this time, just comment, but please please please leave an email if you want to be eligible to win. You can still enter the other giveaways here and here until Friday night. Wow, what a creative use of these fabrics. I love the combination of the two different block patterns. Such a beautiful quilt you created. Your design is just gorgeous! As a beginning quilter, it used to terrify me to walk into a fabric store and have to pick out fabrics to use in a quilt because I never knew what 'looked good' together. But after looking at a lot of your designs, I have a better understanding of how you make them all work and a fabric store doesn't scare me anymore...lol. Again, beautifully done, keep up the amazing work! How exciting and the quilt looks awesome. Way to go!! I think you did a beautiful job. Love it. Flying cartwheel looks great. Gives me ideas. I think that you have done a fantastic job. I'll pass on the fabric though although you are being very generous. Great quilt. I wouldn't have a clue how to use those fabrics. Not what I would choose, but, I really like the finished product. The blog post about your quilt and you was nice, too. Love it! I love the fabric too! I love the turning cartwheel as a table topper. 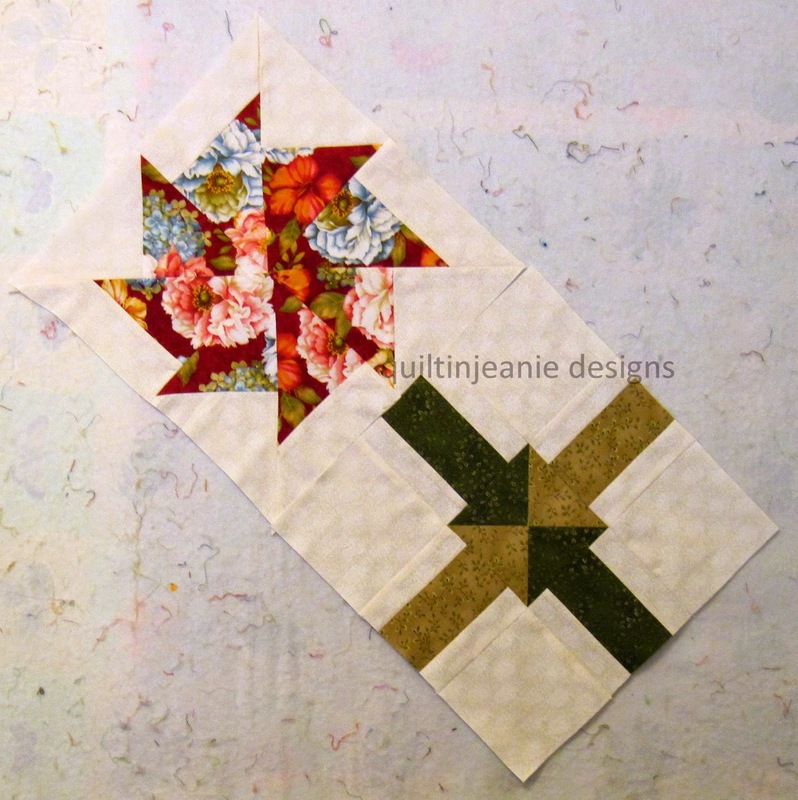 A quilting finish and a start! Do you wait by the mailbox? You can't have enough bags! 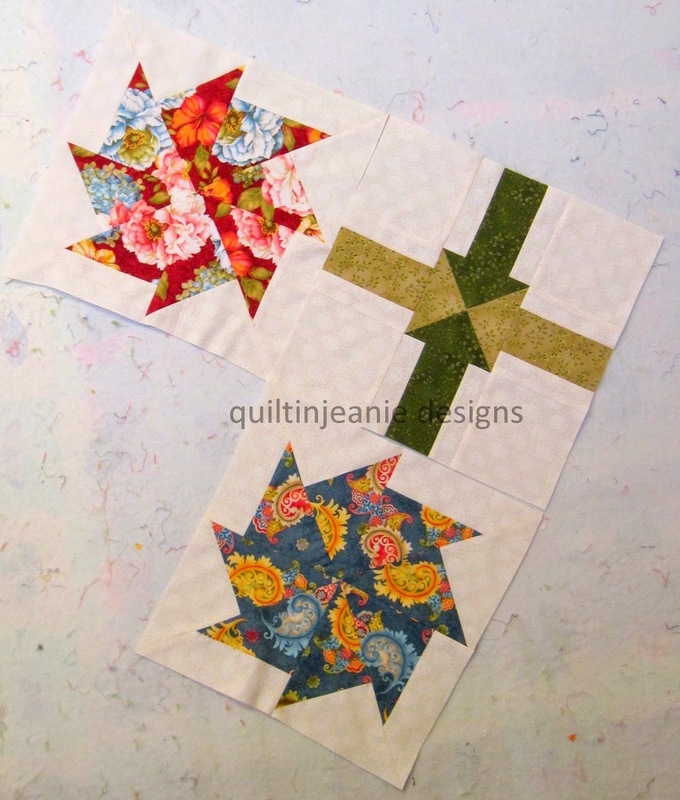 Quilting Retreat Challenge...who's up for it? Kaleidoscope Fun, Stack n Whack style! Stack n Whack revisited....have YOU made one?